Chair of the Fire Authority, Cllr Bob Rudd, and the Police and Crime Commissioner for Cheshire, David Kean. 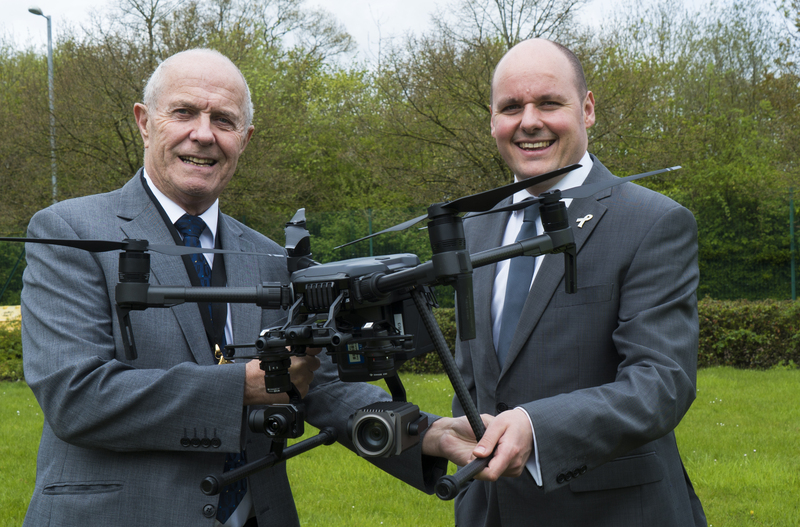 Cheshire Constabulary and Cheshire Fire and Rescue Service have joined forces to fund an Unmanned Aerial Vehicle (UAV), which will be used to assist with police enquiries and fire incidents during a six-month trial period. Three police officers and three firefighters have been trained and accredited to the CAA standards to pilot the drone, which will be used to support various operational activities during daylight hours in the trial period. Drones are being used in 22 other police forces across the country and it is expected that Cheshire Constabulary will use it for a variety of purposes, including: searching for missing people; assisting with public order events; assessing road traffic collisions; and identifying cannabis farms using the thermal imaging camera. The drone, a DJI Matrice 210 with a powerful digital camera and a thermal imaging camera on board, will be based at the joint police and fire headquarters in Winsford. During the trial period it will be deployed only in daylight hours. Police and Crime Commissioner for Cheshire, David Keane, said, “Police currently use the National Air Support Service (NPAS) for all its aerial requirements, such as search and photography. Although manned aircraft will always be required for some operational activities, there are opportunities, such as when aerial photography alone is required, that drones could be more suitable, quick to deploy and more cost-effective. “We have been monitoring the use of drones in other police forces and we think the time is right to test this new piece of equipment out for ourselves. This trial will help us to assess the benefits of the system in Cheshire. Drones are not as common in fire and rescue services in the UK but Cheshire Fire and Rescue Service believes that it could give real benefits to firefighters when dealing with large-scale fires. The thermal imaging camera will be able to quickly identify any heat sources and giving firefighters on the ground the information they need to fight the fire safely.